The political economy of care for dialysis patients is also certainly not immune to the global concerns in US health care delivery; indeed, the contrary is true. Historically, the ESRD Program has been a model for innovative health care policy, as a result in part of the readily tracked population of patients, the high associated costs of the program, the wealth of data available from databases such as the US Renal Data System, and the inherent high level of morbidity and mortality in the patient population, which makes delivery of high-quality care compulsory. 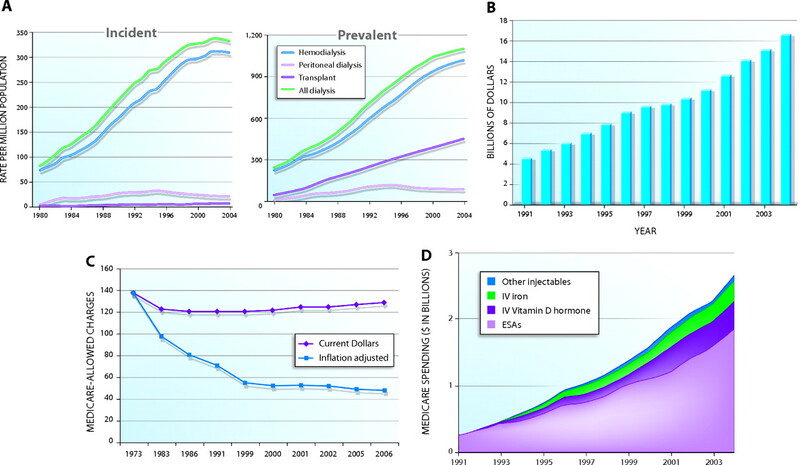 Overall, the secular trends in the economics of dialysis confirm steady decrease in reimbursement per treatment in constant dollars, whereas the providers have succeeded in preserving profits largely as a result of increased productivity, shift in professional mix favoring less expensive labor, use of cheaper disposables including reprocessing of dialyzers, and increased revenues from injectable medications that are administered at the time of dialysis. Nonetheless, there is an overall increase in cost to the system as a result of geometric expansion in the number of treated patients (Figure 1). (A) Trends in the number of treated ESRD patients. (B) Trends in total direct Medicare spending for dialysis services. (C) Trends in average Medicare payment per dialysis treatment in real and constant (inflation-adjusted) dollars. (D) Trends in Medicare spending for dialysis injectables. Source for A, B, and D: 2006 United States Renal Data System Annual Data Report. Source for C: Kidney Failure in the Federal Government and gross domestic product inflation data from the US Department of Commerce: Bureau of Economic Analysis, courtesy Elliott Sloan. In the United States and other nations, the care of dialysis patients is a component of a societal debate because harsh economic realities intersect with the needs of a vulnerable and growing patient population. Currently, the US health care system is on a dangerous and unsustainable path that has been described as a “toxic combination of high cost, uneven quality, frequent errors, and limited access to care.”6 Per capita health care costs and the compound annual growth rate for health care expenditures in the United States are far higher than most Westernized countries. Despite high expenditures, the proportion of US patients who do not get treatment or medication because of cost is also high; as a result, there is a large gap between recommended appropriate care and delivered care for many common medical problems.7 Surprisingly, these data often indicate an inverse relationship between Medicare spending and quality of delivered care.8 Recognized shortcomings in the US health care system have led to calls to transform health care by focusing on simultaneously enhancing quality and controlling costs so as to increase value for patients. How best to increase value for patients, defined as health outcomes per dollar of cost expended, will likely be the dominant factor in a changing health care environment. These ongoing changes in the health care industry are now converging to frame the debate over the care of dialysis patients. In this article, we discuss how trends toward payment for quality in dialysis care, additional bundling of payments into the dialysis composite rate, consolidation of large dialysis provider organizations, the need for nephrologists to care for a large population with chronic kidney disease (CKD), and a worsening manpower shortage in nephrology all have the potential to affect dramatically the dialysis patient–nephrologist relationship. We discuss the need to preserve core values that are encompassed in the patient–physician relationship. An obvious approach to increasing value for patients who require dialysis care is to pay physicians and providers more when a higher quality of care is delivered, particularly if this results in better patient outcomes. The focus on improving quality has been led by the Institute of Medicine, beginning with its 1991 report on kidney failure.9 Payment for quality programs, also known as pay for performance (P4P), are rapidly growing in the private sector.10 In the public sector, the Medicare Payment Advisory Commission has recommended linking payments to quality of care in the dialysis setting, and the ESRD program is likely to be an early P4P focus for the Centers for Medicare and Medicaid Services (CMS). The value; feasibility; pitfalls; and appropriate risk-adjusted, standardized, evidence-based quality metrics for a P4P program in dialysis care are being vigorously debated within the nephrology community.11–13 Even though evidence to support a linkage among development of clinical performance measures, P4P measures, and improved clinical outcomes is, at best, modest,14,15 sufficient momentum has gathered that implementation of a P4P system in dialysis care is perhaps inevitable. Nonetheless, considerable challenges exist in developing payment systems that use validated measures of cost, quality, and outcomes while aligning incentives for optimized patient care. Perhaps the most important and contentious element of the current P4P debate has to do with whether performance should be measured using process measures (e.g., adequacy of dialysis, achieving target hemoglobin) or outcome measures (e.g., hospitalization, mortality rates). Many have argued that payment for achieving process measures to physicians and providers is more fair, because medical decision making can have a more direct impact on process measures than patient outcomes. However, Porter and Teisberg6 argued that a focus on process rather than outcome measures inevitably results in creating systems that provide payment for compliance rather than performance. They provocatively stated that the net result of payment for process measures will be to increase overall costs, discourage innovation in health care delivery, and not add value for patients. It is likely that at least initially, P4P systems in dialysis care will incorporate a mixture of process and outcome measures. In the past decade, the landscape of the dialysis industry has rapidly evolved as a result of the explosive growth and consolidation in the for-profit sector and a corresponding contraction of market share for independent units (Table 2).16 With the completion of the DaVita acquisition of Gambro in 2005 and the Fresenius acquisition of Renal Care Group in 2006, the dialysis industry has evolved into a classical oligopoly in which a few providers deliver the majority of services. These two large dialysis organizations now have a national dialysis clinic market share of approximately 70%.17 How this industry consolidation affects patient care and clinical practice will have an impact on the specialty of nephrology in the United States for the foreseeable future. Consolidation is certainly not unique to the dialysis sector of the health care industry and is driven by universally applicable and compelling market forces. Indeed, dialysis industry consolidation was predicted by Rettig and Sadler5 at the beginning of the decade. The potent business and financial advantages that accrue as a result of consolidation in a market-based system include volume-based cost efficiencies (often referred to economies of scale), technical efficiencies,18 improved information and tracking systems, access to affordable capital, vertical integration of service and product, the ability to offer attractive one-partner solutions to payers, professional lay management, and many economies of globalization. Consolidation allows dialysis providers to maintain profit margins in the face of declining constant dollar reimbursement (Table 3). Industry consolidation also offers demonstrable clinical advantages, including the potential for improved compliance with process and protocol, structured accountability, standardization of care across a large national system, robust quality improvement, and integrated information and reporting systems, all of which can translate into better care with improved outcomes. Selected quality metrics, including adequacy of dialysis, anemia management, vascular access management, and prevalent mortality rates, all have improved in the past decade.13,16,19 Recent data suggest that a greater proportion of patients in for-profit dialysis units meet benchmarks of care in anemia management, dialysis adequacy, and nutritional status, albeit with similar mortality risks.20 Although it has been suggested that it is the chains that deserve the credit for these improved outcomes,21 a more balanced view is that improved outcomes are the result of the productive synergy between structure and process. The structure is provided by the chains themselves with their many business, technical, and clinical advantages. Process incorporates algorithms for the delivery of care, using clinical and laboratory benchmarks established by the professional community of nephrologists, as enumerated in clinical practice guidelines, such as the Kidney Disease Outcomes Quality Initiative (KDOQI). This positive synergy and extensive cooperation between the professional and the corporate communities account for substantial patient benefits that have been realized in the past decade. Consolidation is not without its hazards and disadvantages, however.22 Problems that are intrinsic to any large corporate entity can include a large bureaucracy that by its very nature tends to react slowly to change, compartmentalization of personnel and function with limited cross-talk, and centralization of decision making with inefficient and incomplete flow of information downstream from the board room to the clinic. As a result, clinical nephrologists, many of whom now function in a dialysis-centered practice setting, may see themselves as a small cog in a big machine (not unlike Charlie Chaplin in the 1936 classic movie Modern Times). With industry consolidation, multiple legitimate stakeholders with competing interests converge at the point of care. Corporate leadership and management with fiduciary responsibilities to shareholders, shareholders with an expectation of fair return on their investment, patients with an entitled expectation of the highest possible quality care, payers with an interest in cost containment, and the pharmaceutical and equipment industry all have a vested interest in the provision of dialysis. At the nexus of these competing stakeholders are the patient care providers—nephrologists, nurses, social workers, dieticians, and other members of the patient care team—who are obligated by a moral, ethical, and social contract to provide the highest possible quality patient care on a day-to-day basis. One of the more subtle risks of consolidation is the evolving relationship between the large dialysis organization and the nephrologist. The transition to corporate ownership of the vast majority of dialysis units has virtually eliminated the model of physician-owned dialysis units. Physician ownership of facilities combined with self-referral and care of patients presents potential conflicts of interest, analogous to current concerns over physician-owned specialty hospitals.23,24 As medical directors of corporate-owned dialysis units, many nephrologists who function as medical directors are now directly compensated by dialysis providers. Historically, nephrologists have usually had an arm's-length relationship with corporate providers, serving as independent contractors rather than actual employees. However, in the current era of more extensive and aggressive consolidation, a new business model has emerged with nephrologist as chain employee. This new employment and practice model risks loss of professional independence and may present unavoidable conflicts of interest for the nephrologist. As an employee, the nephrologist will depend on the good will of the dialysis corporation for his or her livelihood and the next contract renewal but must be willing to advocate consistently for the best interests of his or her patients. Another form of “consolidation” that may have a further impact on dialysis patient care is the potential for bundling Medicare's payment for drugs and other services with payment of all ESRD services. Since 1983, Medicare has reimbursed dialysis providers through a composite rate that is designed to cover the cost of services that are associated with a single dialysis treatment, including nursing and other clinical services, social services, supplies, equipment, and certain laboratory tests and drugs. Under the composite rate, dialysis providers receive a fixed payment irrespective of the actual costs incurred in the delivery of these services. The composite rate for routine dialysis-related services was the first of Medicare's numerous payment systems designed to set broadly a fixed prospective rate of reimbursement for clinically related services. Currently, payment for certain drugs and laboratory tests that have become a routine part of the care of dialysis patients since 1983 are covered separately by Medicare (Table 4). In recent years, the General Accounting Office, Medicare Payment Advisory Commission, and CMS all have recommended expanding the bundled payment for dialysis services to include separately billable drugs and possibly other services.25 The Medicare Modernization Act of 2003 requires CMS to design a system that would bundle payment for drugs together with other ESRD services under a single rate and to design a model demonstration project to test the feasibility of further bundling for the ESRD program. The General Accounting Office and others have noted that a bundled rate could achieve efficiency and clinical flexibility by removing financial incentive for facilities to choose one treatment over another25 and by removing potential incentives to overprescribe drugs during dialysis to increase profit margins. However, if bundling is embraced, then steps must be taken to ensure that care will not be compromised for the sake of profit. In addition, the physician's medical fee should remain separate and distinct and not be folded into the larger facility reimbursement, only to be later redistributed by the dialysis provider to the physician. This is necessary to ensure that nephrologists be allowed to remain independent from the providers, because it is independent professional advocacy that allows for a bond of trust between the patient and the doctor. A discussion of the changing landscape of dialysis care needs to include physician workforce assessment. An Ad Hoc Committee on Nephrology Manpower Needs, assembled in the mid-1990s, estimated a need to train between 202 and 661 additional nephrologists per yr, depending on ESRD growth assumptions.26 These estimates conservatively projected a gradual leveling out of the number of needed new nephrologists, which in retrospect may be inaccurate (Table 5). Although the number of nephrologists who currently are being trained is not available, the number of trainees who receive initial board certification in nephrology is likely a good surrogate. Examination of these rates indicates that each year, the number of certifying nephrologists consistently falls short of the targeted goal. The net result is a cumulative deficit (in addition to whatever deficit existed in 1997) of an aggregate 1000 nephrologists. Although the projections and estimations to date have focused entirely on the number of patients in the ESRD program, additional complexities must be brought into the scope of concern. The fastest growing group of patients who are beginning dialysis are older than 65 yr. Given the growing comorbidities of the ESRD population, projections for future workforce need should include adjustment for greater time per patient to allow for the proper care of this increasingly complex population. Primary care and care for non–dialysis-related problems in many circumstances are also provided by nephrologists. Furthermore, the focus on the CKD population and the mechanism to provide care for this group has received tremendous attention since the initial projections on the workforce deficit were made. Estimates of the number of Americans who are living with CKD vary substantially. Analysis from the Second and Third National Health and Nutrition Examination Surveys (NHANES II 1976 to 1980 and NHANES III 1988 to 1994) reveals that the number of adults who are aged 20 to 74 yr and have stage 3 to 4 CKD grew from 2.6 to 3.9 million, an increase in prevalence to 2460 per 100,000.27 However, examination of NHANES data from 1999 to 2000 suggests that the prevalence of CKD in the US population is stabilizing.28 Since then, knowledge of the tremendous mortality rate of these patients29 as well as a potential benefit to survival that is associated with earlier referral to a nephrologists has resulted in an increased focus on access to care.30 This population is growing, is at high risk for mortality, may benefit from seeing a nephrologist sooner, and is the subject of much discussion with respect to the logistics of the provision of care. To date, CKD care has not been included in a systematic assessment of the need for growth in the nephrology workforce. Similarly, the need for nephrologists to care for growing populations of patients who have received kidney transplants or who experienced acute kidney injury must be taken into account. With the number of open positions for nephrologists already double the number of nephrology fellows who are entering practice,31 new workforce assessments are urgently needed to reanalyze predictive models. Newer models of shared care within a team approach and use of technologies to allow a more efficient delivery of quality care should be fostered, vetted, and rewarded on a national level. The doctor–patient relationship is the essence of the practice of medicine, recognized as fundamental since the time of Hippocrates. A century ago, William Osler taught, “The good physician treats the disease, but the great physician treats the patient who has the disease.”32 Or, as noted by Carola Eisenberg, “The satisfaction of being able to relieve pain and restore function, the intellectual challenge of solving clinical problems, and the variety of human issues we confront in daily clinical practice will remain the essence of doctoring, whatever the changes in the organizational and economic structure of medicine.”33 The rapid pace of political and economic change in health care has the potential to alter dramatically the doctor–patient relationship in the dialysis unit. If the nephrologist becomes consumed with simply conforming to process and meeting laboratory quality metrics and as physician autonomy and independence are compromised through changing relationships with large dialysis organizations, then there is a real danger that the nephrologist will lose sight of the patient as an individual. As nephrologists are pulled away from the care of dialysis patients and redirected toward the larger population with CKD, further pressure will be placed on the doctor–dialysis patient relationship. It is the essence and foundation of clinical medicine that the physician act as the patient's advocate and in the patient's best interest at all times. The nephrologist should be the final arbiter of the complex interaction among the corporate provider, statutory regulators, and the pharmaceutical companies as they all relate directly to patient care. The physician and the patient care team uniquely understand the concerns of the individual patient and are aware of the day-to-day tangibles and intangibles that influence and determine the quality of life for the dialysis patient. It is essential that in the coming era, nephrologists strive vigorously to maintain the primacy of the physician–patient relationship and maintain the integrity and credibility of the patient-centered value system and therapeutic environment. This expectation is the very foundation of trust between doctor and dialysis patient. To accomplish this, nephrologists must be willing to play an active role in the redesign of care models and payment systems across the spectrum of kidney disease. The Future Nephrology Workforce: Will There Be One?